There have been so many adaptations of Sherlock Holmes lately, you knew it was just a matter of time before we met up with Sherlock Holmes, age fourteen. The year is 1868, and Young Master Holmes has just been informed that due to his army officer father’s deployment to India, his mother’s illness and his big brother Mylock’s busy lawyer schedule, he won’t be going home for the summer holidays from school. Instead, he’ll be staying with a little known aunt and uncle in the English countryside, far from civilization and anything remotely interesting. Fortunately, his boredom is quickly eased by his new acquaintances: brash and brilliant American Amyus Crowe, who will be his summer tutor, Amyus’s beautiful red-headed daughter Virginia, and scrappy river rat Matty Arnett, an orphan boy the same age as Sherlock who lives off his wits and what he can steal. The four of them form an unlikely detective team when a body is discovered on Sherlock’s uncles’s property. The corpse is lumpy and swollen, and rumors of plague soon blanket the countryside, throwing everyone into a state of panic. But by using the powers of deduction that Amyus Crowe is teaching him, Sherlock soon realizes that while the stranger’s death was caused by something carried on the air, it wasn’t germs or disease. Another body was discovered in the nearby village in the same condition, and Matty claimed to have seen a mysterious black cloud hovering over the house where it was found. Could the two deaths be linked? If so, what was the black cloud and how did it cause two different people to drop dead miles from each other? As he digs deeper into the mystery, Sherlock discovers from a series of mostly innocuous clues a diabolical plan created by an evil genius mastermind to strike at the very foundations of the British Empire. Sherlock’s first foray into investigation becomes a terrifying adventure that threatens to end his life on more than one occasion. But he must prevail, or his entire country could be lost. Great period detail, loads of interesting scientific facts from the time, and the methodical, logical plotting that we expect from a traditional Sherlock Holmes novel are all here, plus some pretty heart-pounding fight scenes. My only issue is the odd cover–since when does Sherlock Holmes have Justin Bieber hair? A fun read nevertheless, and who knows? Maybe they’ll tap the Biebs to play Sherlock in the teen movie version. Stay tuned for the sequel, Rebel Fire, coming out November 2011. The series is quite good, really goes into Holmes’ personality development (and no JB hair :-). 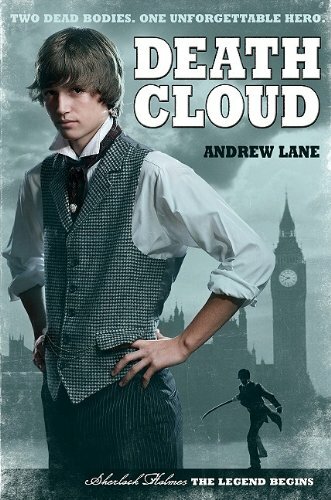 I really liked the historical detail – but as a Sherlock Holmes fan for many years, I just didn’t feel like Andrew Lane really captured his character accurately – even as a boy. And though there was a lot of action, sometimes the story dragged for me. I was disappointed (especially since I purchased it in hardcover!). I ashamedly confess to never reading Sherlock Holmes. I bought this one for the school and brought it home to read. They were prolly hoping the hair would attract a younger crowd but no one picked it up yet! I don’t think it matches the title well. the Canadian/UK version came out a few months before the American one and no Bieber hair for us (despite him being Canadian :p). I’ve been meaning to pick this up for a while, glad you liked it. Is it just me, or books are becoming just like movies? It’s all what is in trend and to take more money from customers. i love reading so much. To me it is like a movie in your mind. I want to read Death Cloud so much!! it sounds very interesting!!! I recently participated in a webinar in which the publisher’s rep touted the Bieber-hair lookalike on the cover of this title as a selling point for teen girl readers. Seriously? Because of course, no teen girls would want to read Sherlock Holmes otherwise >sarcasm off. I am SOOOO glad that I am not the only one who was bothered by the Justin Bieber haircut. That’s JUST what I thought! This book looks very cool. Sure the JB hair is pretty annoying, but I still want to read it alot!